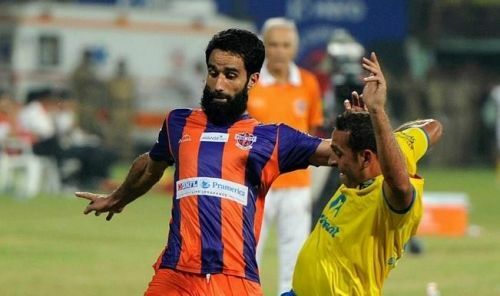 Mehrajuddin Wadoo, the first player from Jammu and Kashmir to make it big in Indian football, feels the future is bright for players from the troubled state. Wadoo, 34, hung up his boots last year after playing with Mumbai City FC in the Indian Super League (ISL). The defender took to coaching post his playing career and is currently completing his AFC ‘A’ license. Wadoo then reunited with FC Pune City as the head coach for their Under-18 team. Mehraj will be joined by Ramesh Bista, who is also completing his AFC ‘A’ license programme. Wadoo, who spoke to Sportskeeda on Friday evening, is extremely happy with the rapid development of football in Kashmir. "The qualification of Real Kashmir in this year’s I-League is most beautiful thing to have happened ever. This will be of immense help for the homegrown players. They grew up watching Bhaichung Bhutia, Sunil Chhetri on TV. And now, they will be able to play against some of the best clubs like East Bengal and Mohun Bagan in the I-League. This speaks of the development that's happening in Kashmir football,” said Wadoo. However, lack of football turfs is hindering the growth of the sport in the state. But Wadoo said the federation and stakeholders are working towards increasing the number of turf grounds in Kashmir. "At this moment, the only ground with an astroturf is in Srinagar, where Real Kashmir will play their I-League matches. But we need to build more such grounds at the earliest. We had no changing rooms but we did it quickly. We did the colouring of the stadium on a very short notice. I am away from my state right now, but everything good is happening there. Once I go back, I will prioritise things and work accordingly,” said the former defender. As the head coach of FC Pune City Under-18 team, will Wadoo invite kids from J&K to train under him? The 34-year-old sounded affirmative. “Of course, I will encourage them. In our state, there is a lot of talent and I will try not to waste any of it. FC Pune City have the best academy and youth development setup in the country. Already, there is a guy (Ashique Kuruniyan) playing for the national team. A lot more will come out in the near future. So, I will train as many students as I can from my state, and let them play in the ISL and the national team,” said Wadoo, who is the only player from Kashmir to don the Indian jersey. Wadoo, who has played for both East Bengal and Mohun Bagan, said he still follows the Kolkata Derby. “How can I not? It's one of the best matches of the country. Thousands of people come to the ground to watch the match. I have played this match before for both the clubs and know how the atmosphere is. I have not been to Kolkata for long but I’m looking forward to going there and watching a Derby from the gallery,” said Mehrajuddin. India will face China on Saturday in Suzhou near Shanghai and Wadoo, who has played 33 matches for the country, feels the match is going to be crucial for the visiting country ahead of the 2019 Asian Cup. “India have improved a lot over the last few years. Qualifying for the 2019 Asian Cup is a great achievement. We should be proud. Playing against China at their turf is always difficult, but I think the players should enjoy their game and not think much about the result,” Mehrajuddin signed off.